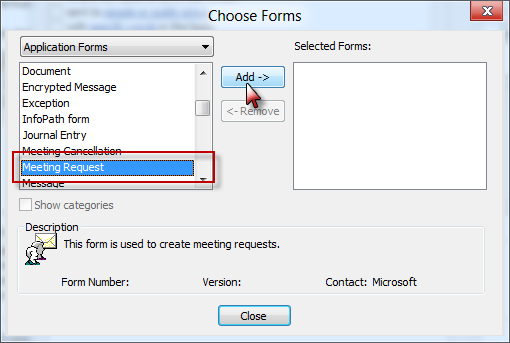 We have a specific user requirement to auto accept meeting requests only from some selected organizers, but I don't see any choice in Rule Wizard for meeting requests. Does anyone have an idea, please? Of course I have an idea. Begin with a rule using the conditions "from people or distribution list" and "uses the specified form", choosing the Meeting Request form under Application forms. Since there is not an action to respond to meeting requests, you'll need to use a script to accept it. Outlook MVP Michal Bednarz offers this script, which you need to add to ThisOutlookSession before creating the rule. This was tested in Outlook 2007 and should work in any version which supports the Run a Script action. The difference between the two is that olSave saves a draft of the acceptance (or decline) and if you don't delete it using the Delete line, a tentative appointment may be added to the calendar. This run a script macro accepts the meeting then moves it to another calendar (a subfolder of the default calendar as written). See Working with VBA and non-default Outlook Folders for the methods needed to move it to other calendar folders. Because moving a meeting adds Copy to the subject, it picks up the original subject and replaces the subject with it after the move. To turn reminders off on the meeting, add these lines to the code. It can either go right after the 'Set oAppt' line or before End Sub. This edit uses the WeekDayName function to get the day of the week and automatically process the meeting. Use the full weekday name in the string. Use this macro to accept meetings only during your working hours. Any meetings before your working time or after your day ends, you be declined. Meetings during those times will be accepted. Steve wanted to know how to decline if there was a conflict. For this we need to check Free/Busy. Checking the Free/Busy is actually fairly easy and the code we need is at Recipient.FreeBusy Method. You need a date to check, and we'll use the appointment start date. The Free/Busy string begins at midnight on this date. The next value is how many minutes are in each Free/Busy "period" represented by the myFB string. After much trial and error, I've decided that 5 minutes is probably the best value, since it's the smallest time period displayed on the calendar. The final value is True or False (if you leave it blank, it's False). False tells Outlook to either return 0 for Free (and Working elsewhere in Outlook 2013) and 1 for "not free". True returns values specific to the Show time as setting. Use that value to create a string of the periods the appointment covers. If you want to build in some downtime between appointments, subtract from i before calculating ( i - 2 gives 10 min between appointments) and add the same value to the duration calculation. test = Mid(myFB, i-2, (oAppt.Duration / 5)+2) starts 2 periods before the start time, or in my example, leaves 10 min between the last appointment and this one. To help you understand the code (and check my calculations), I left my Debug.Print code in. Open the Immediate windows in the VB Editor using Ctrl+G or select it from the View menu to see the results. Those 0, 1, and 2's each represent a 5 minute block of time beginning at 12:00 AM on that date. If you want to check for specific values or consider tentative appointments as Free, you can change If InStr(1, test, "1") Then to use different values. Use If InStr(1, test, "2") or InStr(1, test, "3") Then to check for Busy and Out of Office. instead of set oappt = item. If someone books a meeting in a free slot, it auto accepts as expected. If they then amend the meeting e.g. change the title of the meeting then the room will auto decline the meeting when the update is sent. The updated meeting request seems to collide with the original meeting. Is this something that you have come across before? Yes, the user is inviting the resource. Just been looking at the debug code. When the initial booking is made the free/busy check string is 111111111111 as the incoming booking has been tentatively added to the calendar before the free/busy check. No problem as I am saying 2 - decline, anything else - accept. When the title is changed on the booking and the update is sent, the free/busy check shows 222222222222 as the slot is indeed taken by the booking we are trying to amend. It sends out a decline message and the booking is removed from the calendar. If I send out updates again then the booking is re-added as the slot is free again. I have attached the code we are using and I am bracing myself for the obvious error I have clearly made! it almost sounds like it is seeing the subject change as a new item, not an update to an existing item. I'll take a lot at the code and see if anything jumps out. oRequest.Delete seems like it will actually delete the meeting itself, not the invite email like I thought. oRequest is IPM.Schedule.Meeting.Request - so it should delete the email message, not the meeting itself. what are you using for the value in If InStr(1, test, "1") Then ? Trying this now in Outlook 2016. It doesn't seem to work as every time I test it, I still get the email and the choice to Accept. ok... i can repro it not working... will need to figure out why. All i know right now is that the macro isn't running at all. Very interesting and useful post. Many thanks. I have been doing some research on the web on a problem that I have with no success. Your solution is the closest I got. I am often sent meeting requests within the day. Which annoys and hampers all the schedule. Would it be any way to send an Decline with a certain text (like the out of office feature)? For instance, for all meeting requests in which time of meeting minus the time of being sent is less than 12 hourse, send a decline along with a certain message (i.e. Dear sender,I am unable to check availability as this invite was sent in less than 12 hours. COuld you bla, bla, bla...? I think this feature would be great for a lot of people. If this problem has been addressed in other chats, please forgive me. Could you address me to where it is solved? oResponse.Body = "Sorry, I need 12 hours notice." doesn't work of course. Any idea why that is and how to fix it? Deleted appt should be removed by the response... but are you deleting the request before the apt? what is the full code you are trying to use?